How do you feel about pinafore dresses? Love, hate, indifferent? Can't wait to hear your thoughts in the comments below! Beautiful dress! Love how you paired it with the vichy shirt! What a fun dress! So unique and different! That gingham blouse looks so good with it Gabrielle! Each time you pair it with something else, it gives it an entirely different look. Lovely photos. They probably wouldn’t suit me but the pinafore dress suits you so well! It has that kind of girlish charm which I think goes with your look so easily. I do love that high neck blouse though! Those sleeves are just... wow! I’m trying to add a lot more statement sleeves to my wardrobe now & this blouse is so pretty! I swear only you can make pinafore elegant, Gabrielle! Love how the ruffle goes with it! I really adore this look, Gabrielle. 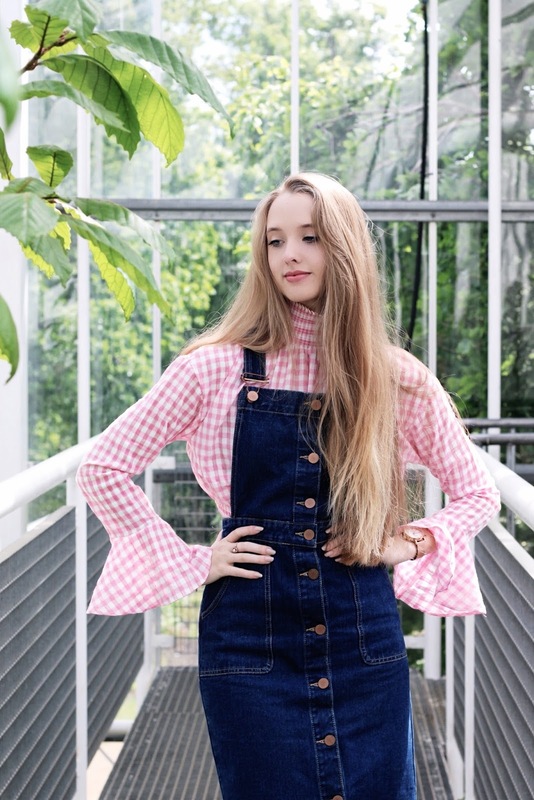 Love how you styled this denim overall dress with that pink top. You look so beautiful. An interesting way to wear the statement blouse, and one that I would not have thought of. 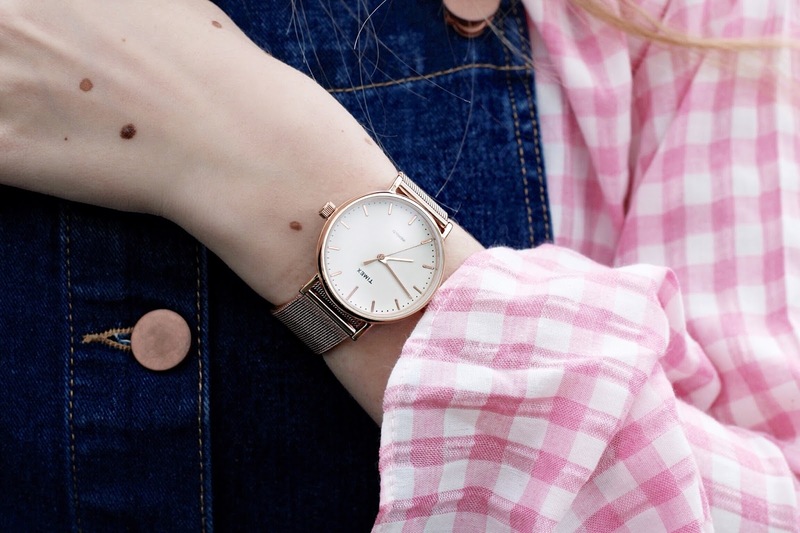 This is a nice combination, gingham and denim always work. 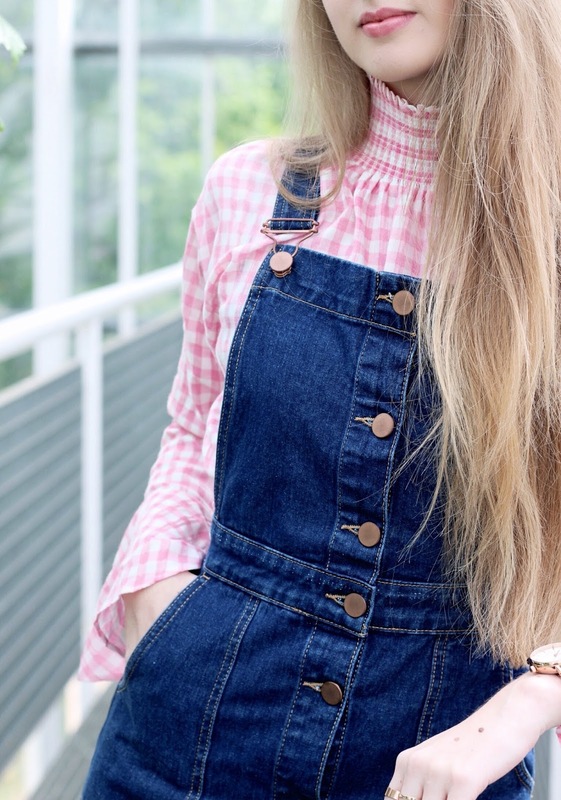 What a great dressed up way to style a denim pinafore dress, you look fab! LOVE the blouse you're wearing with yours! 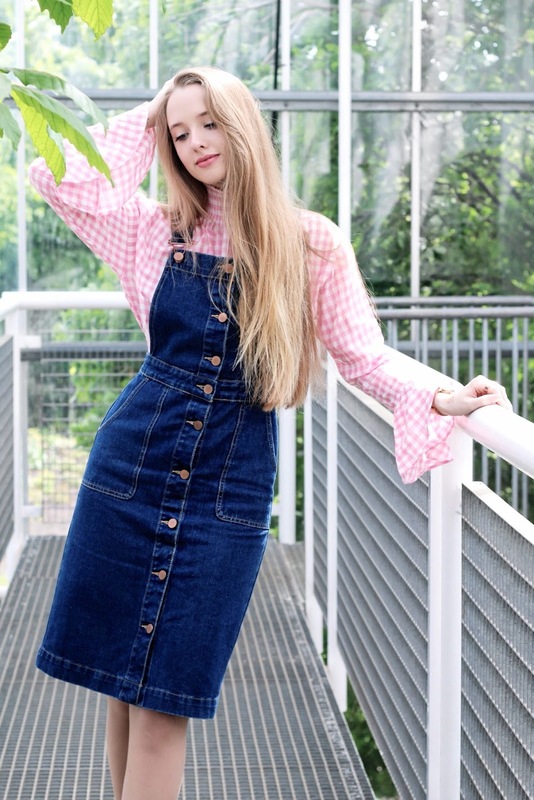 Pinafore dresses can be quite versatile and your styling of this outfit really brings out the femininity and fun Gabrielle! I didn't even know that I needed a pinafore dress until know!? 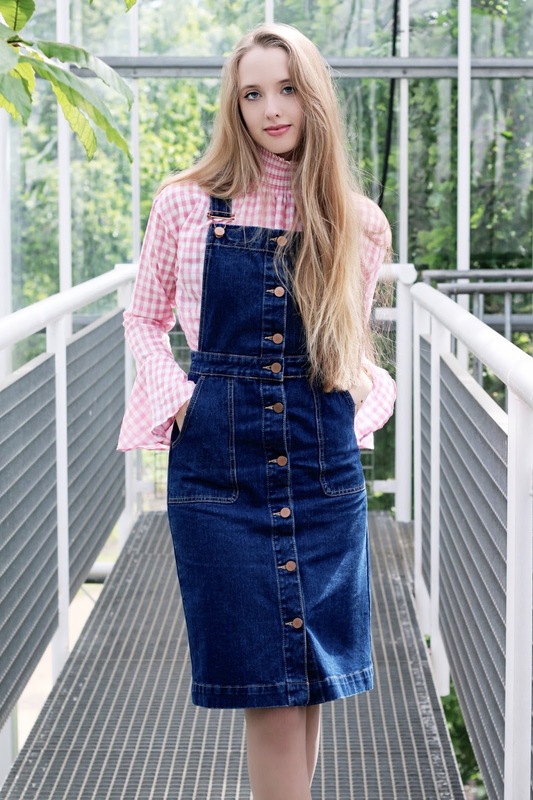 But damn babe, that denim pinafore is genius! Love that you paired it with gingham, such a sweet contrast, and the subtle statement of the sleeves is so good. Love love the overall dress and how it buttons down the front! Such a perfect combo with that gorgeous pink gingham underneath it! Looking great as always Gabrielle!! The statement top is so gorgeous and it looks perfect with the denim dress! I swear you own all the best blouses! This one is gorge and I love it with that pinafore dress - the neckline is sooo nice and again the sleeeves <3 You always look incredible. 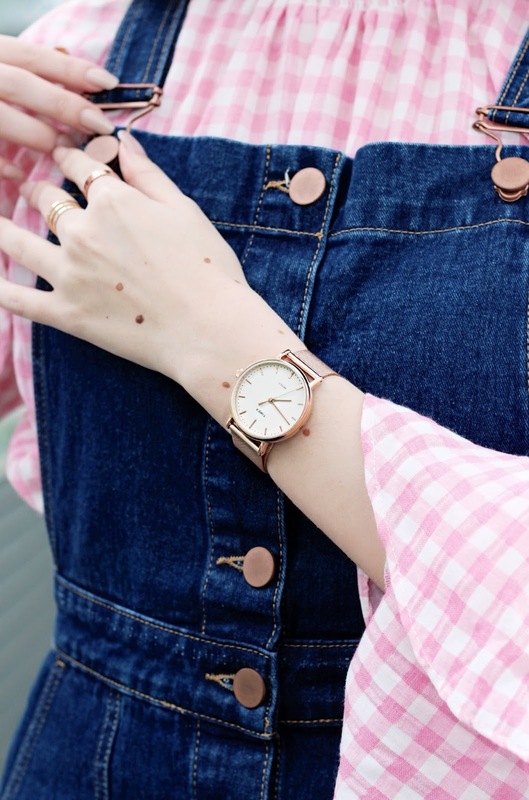 Love the contrast of gingham and denim! So chic! This pinafore dress looks like it was made for you! I love that you paired it with the gingham top too! 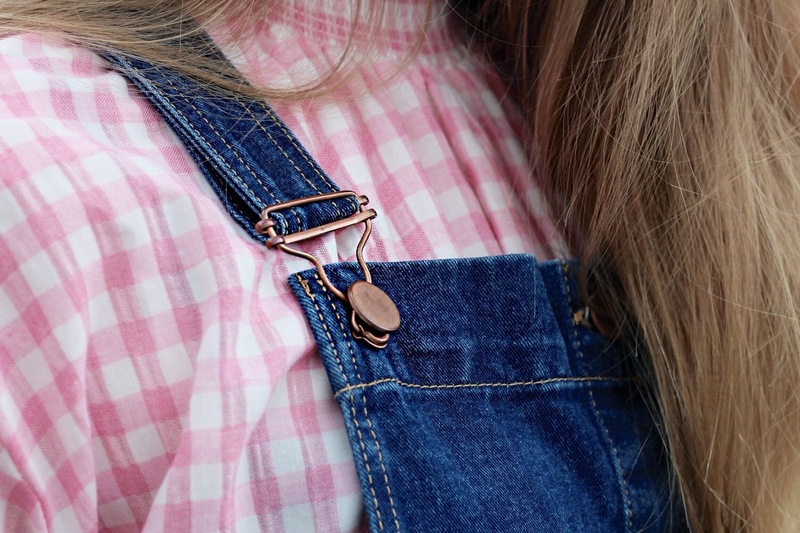 The pinafore was definitely a great find, and your gingham blouse makes it sing. Sorry to hear that it's been cooler there, but you manage to look very fresh and springy (and stylish!) in spite of it. This is such a sweet sweet lovely outfit you have got on! I used to have a jeans dress just like this. But you are right they do open the door for many other looks, occasions and fun to style it too. Have a nice weekend, Gabrielle! Pretty in pink. I like the combination of denim and this feminine color. This is super pretty & girly i love it. you look fabulously cute. love everything you're wearing and love your hair! 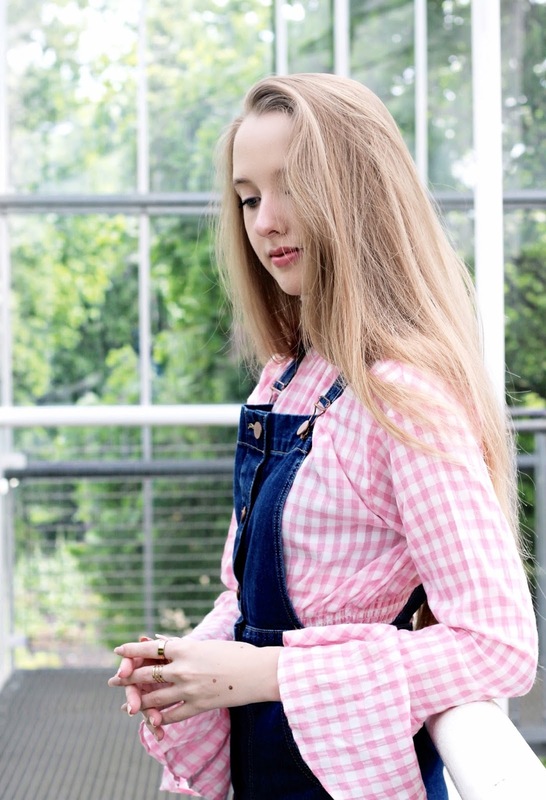 Oh I love this buttoned denim dress, It looks so good with the gingham blouse ! That blouse is such a perfect pairing with that pinafore dress! The colour combination works very well. This styling is both relaxed and sophisticated...I love it. You look stunning dear. That pink gingham shirt is amazing. You look stunning, Gabrielle. Such a perfect outfit!!! Love the gingham on you so pretty! This reminds me of my love for my denim dungarees, over Summer I adored the amount of looks I could create with it but come winter, it was left lost and forgotten in my wardrobe! I don't actually have a pinafore dress but similar to the dungarees, you can just tell that you're going to get lots of use of it! You look so lovely! I love this combination so much! Such a cute outfit <3 Love the dress and the blouse!! I love the whole outfit babe, you look so beautiful! Love the details of the jeans dress so pretty! you look so adorable! Very pretty girly set! So cute! And can we talk about that top???!! LOVE!!! You look so beautiful! 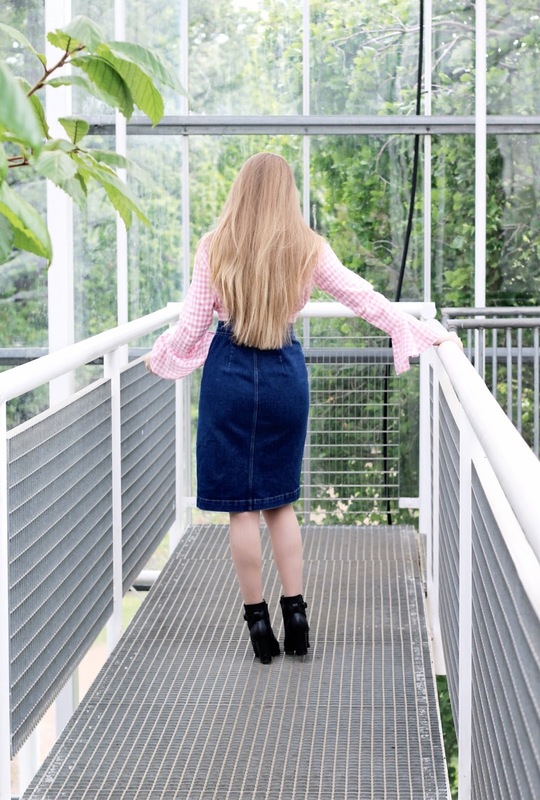 I have never heard of pinafore dresses but I definitely agree that it can be worn during all seasons!